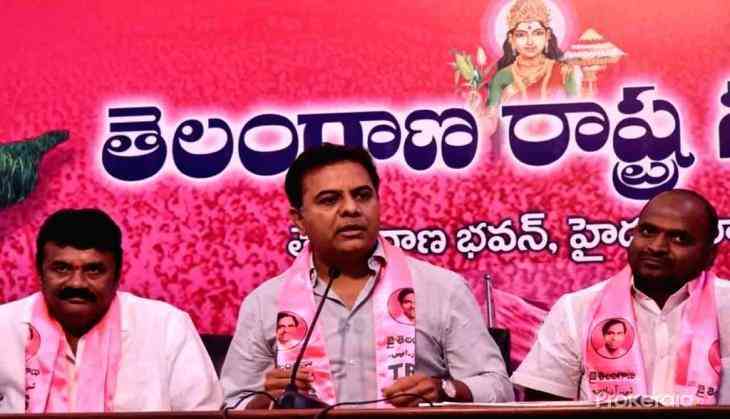 Asserting that neither the BJP nor the Congress would be able to get a clear mandate in the Lok Sabha polls, Telangana Rashtra Samithi (TRS) working president K T Rama Rao has said that a 'non-BJP, non-Congress' front will soon be a reality. The country - which will go to polls in seven phases across 543 constituencies from April 11 -- will see a wind of change in Indian politics with regional parties likely to win at least 160-170 seats and lead a regional force, he said and added the BJP and the Congress will suffer setback and may not even cross the 150 and 100 mark, respectively. The TRS working President also said that his father and Telangana Chief Minister K Chandrashekar Rao had all "the qualities and capabilities to become Prime Minister." "Between us non-Congress and non-BJP parties have 160-170 MPs. May be there comes a time when the Congress and BJP decide to support the coalition instead of leading it. Let the regional forces lead," Rao told PTI in an exclusive interview. The real power is with regional parties and there is no need to empower the BJP and the Congress, he said, adding it is for this reason that Telangana Chief Minister K Chandrashekar Rao, also called KCR, is trying to rally 'non-Congress, non-BJP' parties to come together. "He (KCR) has been saying why should Trinamool Congress throw its weight behind the Congress right before the elections and make them look bigger? What is the point? You can hold all your aces up your sleeve and wait till May 23. Post the elections, we all can sit and decide," he added. give their strength and resources to national parties and make them look bigger?" he questioned. Asked which regional parties are part of a 'non-BJP, non-Congress' front, Rao said negotiations are still on and at an appropriate time everything will be disclosed. "As of now, AIMIM is part of it. There are many parties which are not with UPA or NDA may come. In Tamil Nadu, AIADMK is with BJP, DMK is with Congress, but a bunch of others is in neither camp. Who knows what they will throw up? Go around the country, it is a similar situation." "So, between all of us, we could have anywhere between 120-130 seats. If there are others joining us, it could be 160-170 seats. National parties will have no choice but to support us. Anything can happen," Rao said. Asserting that the LS election is all about setting the tone for governance in Delhi, he said, "Let the BJP and Congress suffer with the bipolar disorder. They might think it is a two way tussle between Modi and Rahul and the rest of the country." Asked who will be the prime minister if such a front becomes a reality, the TRS working president said, "Ideally, we would want a non-BJP, non-Congress prime minister. I do believe Telangana chief minister has it in him. KCR is an able administrator and why cannot he lead the country." Minister has 44 MPs in the Lok Sabha. If KCR with 16 MPs or wanting to get 16 MPs, wanting to become prime minister is a tall order, so is Rahul Gandhi with 44, in my opinion." "The saffron party has certainly fallen from the high of 2014 when they got 283 seats. They are facing one of the toughest situations. I don't foresee them crossing 150." Even the BJP's rhetoric in their election campaign shows the party does not have enough to showcase their governance or what they have delivered, he said. "Today, their campaign is all about Pulwama attack. The Prime Minister's sudden announcement about anti-satellite mission, trying to own the DRDO's achievement... all this points to the fact that after five years the BJP leadership really does not have a lot to talk about development issues," he observed. Unfortunately, Congress too has failed to inspire any enthusiasm among the country's electorate, he said and added, "In my opinion, the Congress will not cross 100 and BJP will not cross 150.